One of my favorite things about living at 62 Boylston (when I used to live there) was that they had these old pictures of Boston hanging on each floor. I always found it interesting to see how much (or how little) things had changed. On the 1st floor they had a picture of the 62 Boylston when it was the Hotel Touraine. This book that I just got (Thanks Liz!) - Historic Photos of Boston - goes one step further. It has a picture of the building when it was the Hotel Pelham in 1857. Needless to say, that area has changed quite a bit. Boston is an American city quintessentially founded upon change. From its birth to the present, Boston has consistently built and reshaped its appearance, ideals, and industry. Through changing fortunes, Boston has continued to grow and prosper by overcoming adversity and maintaining the strong, independent culture of its citizens. Historic Photos of Boston captures this journey through still photography selected from the finest archives. I had a lot of fun leafing through the pages of this book. There were some really great photos. 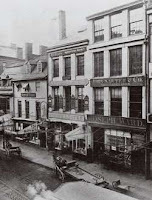 Besides the inhabitants inside, Quincy Market hasn't changed much since 1870. It was also cool to see a picture of what the Cyclorama in the South End looked like back in the day. Apparently, they used to have a 50 foot tall by 400 foot long painting of the Battle of Gettysburg painted in a full circle inside. If you're looking for a coffee table book that people will actually look at, this is the one to get. Click (here ) to pick up a copy from Amazon. 1 Response to "Book Review: Historic Photos of Boston"
FYI, that painting of the Battle of Gettysburg is now at the National Gettysburg museum in Gettysburg, PA. Anyone who's been to the battle site is sure to have seen the painting as it's one of the highlights of the site.